Definition at line 24 of file ctx_s.c. Definition at line 25 of file ctx_s.c. Definition at line 23 of file ctx_s.c. Definition at line 26 of file ctx_s.c. Definition at line 176 of file ctx_s.c. Definition at line 130 of file ctx_s.c. Definition at line 66 of file ctx_s.c. Definition at line 278 of file ctx_s.c. 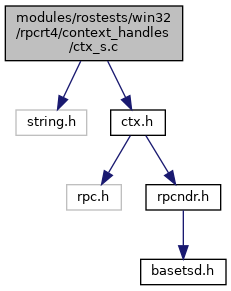 Referenced by hello_CtxClose(), hello_CtxHello(), and hello_CtxOpen(). Definition at line 319 of file ctx_s.c. Definition at line 49 of file ctx_s.c. Definition at line 237 of file ctx_s.c. Definition at line 261 of file ctx_s.c. Definition at line 268 of file ctx_s.c.